Why Hasn’t the Stat Revolution Come to Hockey Yet? Is it just me, or does it seem like sports trend of using and studying more statistics (especially newly tracked numbers) to improve your team not really affecting hockey all that much. There’s been a trend toward Finnish goaltenders who are great at not giving up rebounds and forcing the puck to the corner, but I don’t think that was due to any study of the actual numbers, just people realizing that the goaltenders coming from Finland are awesome. Carrying the puck in is way better than dumping it in, more than twice as good — and it’s not because of odd-man rushes or player skill or any other external factor; it’s just because having the puck in the opponent’s zone headed towards the goal is a lot better than trying to outrace the opponent to try to get the puck in the corner. Most people don’t recognize just how big the difference is, and the data suggests that teams should be trying harder than they are to carry the puck in. If coaches are telling their third line to dump the puck, they are probably giving away scoring chances. If coaches are telling the players to dump the puck in borderline situations where they think carrying it might lead to a turnover, they are probably giving away scoring chances. Even regrouping and trying again might be better than dumping the puck in, especially when the team has their top line on the ice. Of course this all needs to be taken with a grain of skepticism, as the dataset is very small and who knows what a larger amount of data will say about these preliminary conclusions. As you can tell by the crazy number of Wins attributed to the Rays, that I do not take into account a variable CPW, where the higher the win total the more it costs for additional wins. But even without that, I wonder how close to this outcome, standings-wise, we will see? Will the Royals be a wildcard team? How many teams will actually have 100+ wins (last year: 1)? Want to make your own predictions? Go ahead and leave a comment and we can come back here in a few months and see. This is a continuation from yesterday’s post. In this round we have 4 different groups of games. Again I’ll start with the easier ones. 1/8/9/16 – The 1 seed wins here 87% of the time. A 16 seed has never actually made it to this game so the remaining 13% is split between the couple of times that an 8 or 9 pulled off the upset. Only way I’d pick an upset here is if I were in a big pool and wanted to go with a high risk strategy. 2/7/10/15 – While this isn’t as cut and dry as the 1 seed games, the 2 seed moves on 65% of the time. If you’re looking for a 2 seed to fall, look at experience. This year Missouri is a 2 seed but they got a pretty new coach and they could go against Florida with Billy Donovan who’s taken his squad to the Elite 8 4 times. Other than that, go with #2. 4/5/12/13 – If for some reason you have a 12v13 match here, pick the 12 seed as they have a 8-1 record but if you want to dig deeper, pick the team with more experience in the tournament. If you have a 12/13 going against a 4/5 It’s not as cut and dry as the seed value may imply as, historically, this upset is relatively common. The most likely match-up is, of course, the 4v5. History doesn’t tell you too much with 4’s having a slight edge winning 52% of the time. I’d look at points per game and Pythagorean expectation here… and that makes me look at maybe New Mexico over Louisville, but it would be hard to pick against Pitino and his experience. 3/6/11/14 – If it’s 3v11 or 6v14 you should probably go with the 3/6 as they have won 72% of these past match-ups. The 3v6 game is where you need to spend some time. If I had to pick an upset here, I’d go with Cincinnati. Maybe you want to go against the crowd? Pick UNLV to upset Baylor, hell, pick them to take down the Blue Devils. No one likes Duke so it’s a feel good pick and if it happens, no one else in your pool made that pick. 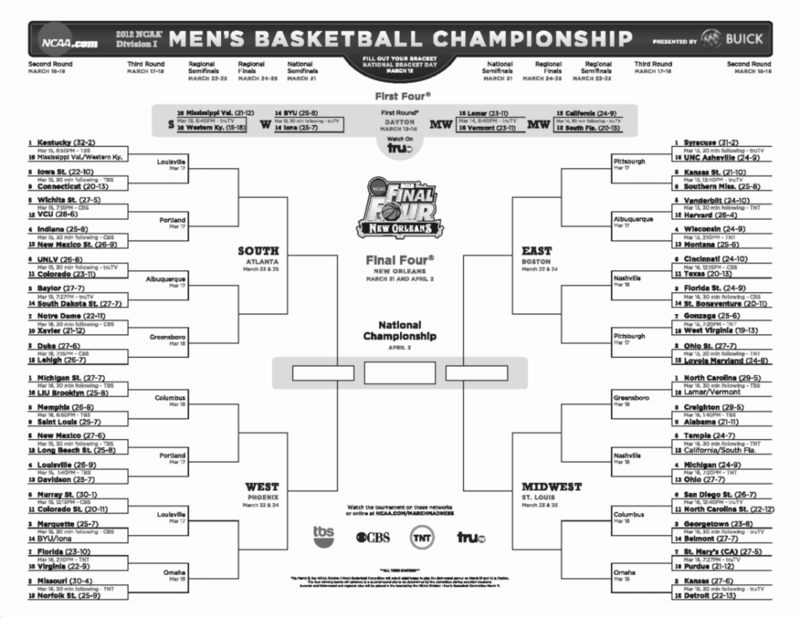 1 Seed Bracket – on average, three out of 4 top seeds will make it past this round. Remember that when you decide you want to take down a 1 seed. Which one of the 4 looks ripe for the picking this year? Syracuse. They’d most likely take on a very good Wisconsin team and they are down one of their better players. Then again, you could play the odds and just advance the 1 seed if you wanted to be a bit more low risk. 2 Seed Bracket – In general the 2 seed wins here (70%) but if it’s 2v3 then it’s more reasonable (62%). If you’re looking for a team other than the 2 seed to come out of this bracket, I’d say maybe Baylor (or maybe even UNLV) over Duke or, for even more madness, pick Florida over Marquette – It could happen. Look at the blue lines in the above chart. You should probably keep your Final Four selections to that realm of possibility. Look at what 1 seeds look weakest (Syracuse) or look at the better 2/3/4 seeds (Ohio State, Kansas, Baylor, Wisconsin) and make you selections from them. The darker the color the larger the seed number. The lighter the graph the further the 1,2,3,4 seeds have gone. I hope that this helps you, because it helped me make my decisions even though I went against the math a few times. There are hundreds of ways to go about picking your office pool brackets. You can go with your gut. You can go with the cooler mascot. You can go with whatever school has a higher seed and toss-ups based on a coin flip. Or you can be a giant nerd like myself and pour over a giant spreadsheet full of numbers trying to predict the future better than Miss Cleo. All of these strategies have merit and when it comes down to it, it’s still the future and we don’t know what will happen. First a little primer from ESPN’s Numbers Never Lie for a quick rundown of making your picks with the help of numbers. 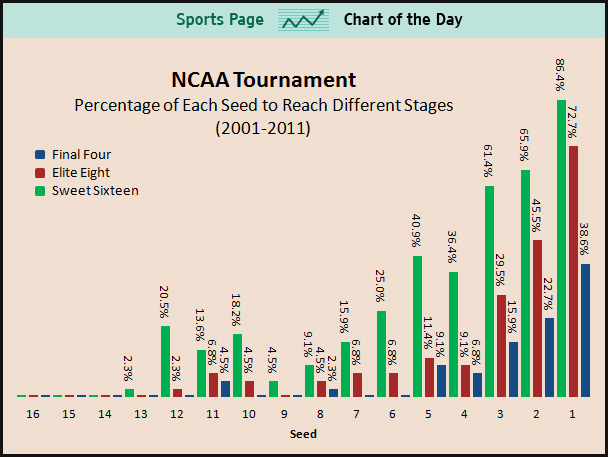 Let’s start with the 1 seeds: The #1 seeds have lost the opening game 0% of the time So here’s an easy 4 points. Actually, I’ll go even further: Advance the 1 seeds to the Elite 8 (History shows that #1s make it this far 85% of the time). If you pick against a 1 seed here, you are probably giving away points. The tough call would be Syracuse with a missing Fab Melo, and a lower Pythagorean Expectation then Wisconsin. Now the 2 v 15 games: A 15 has done the upset 4 times in the past 27 years, so I wouldn’t get your hopes up. There hasn’t been a 2 over 15 upset in 11 years now, so I guess we’re ripe for the picking. But even if the 15 did win, they never make the Sweet 16, so hedge your bets, and take the point (or loss of a point that no one else is gonna get anyway) and stick with the #2. 3 v 14: The #3 has won 85% of time in the past so now is the time to look into possible first round upsets, but looking at the field this year, I don’t see anything upsetting. 4v13: The lower seed wins 78% of the time here. So picking the right upset at this level might be nice. If I had to choose one, I’d take a look at New Mexico State over Indiana. Upset here would probably come from a high scoring team doing well, and NM St. are the highest of the 13 seeds with an average of 78.5 points per game. Another suggestion is to print this out and then throw darts. 5v12: Time to stop giving the low seeds a free pass. Lower seeded teams only take 67% of these games historically. This year I’d think about upsets from VCU, who did well last year, or Cal (if they win tonight) based on their Pythagorean expectation. 6v11: Again 67% to the lower seeded team historically and that is against the trend of recent years. Possible upset here would be Texas over Cincinnati based again off Pythagorean but also coaching experience. 7v10: 60% for the 7 seed. Possible upsets here would be Purdue over St. Mary’s or Virginia over Florida. 8v9: Pretty much 50-50 — Actually the 9 seed wins this 53% of the time. Since this is pretty much a toss-up anyway, go with your favorite method to pick these. Mine (as you may have noticed) is Pythagorean expectation. With this the only “upset” (can a 9 over an 8 be an upset?) being Alabama over Creighton. Don’t worry too much about these games, because the winner is just going to lose to the 1 seed in the second round. That should cover you for about 32 games. I hope to go over the remaining 32 games and to finish this all up tomorrow morning. Until Then you can check out this list of reasons to root for each team in the tourney. Also check out Wired for their method of going against the crowd to gain points that no one else in your pool will. Geekapollooza AKA Sports Analytics Conf. The conference goal is to provide a forum for industry professionals (executives and leading researchers) and students to discuss the increasing role of analytics in the sports industry. MIT Sloan is dedicated to fostering growth in this arena, and the conference enriches opportunities for learning about the sports business world. The conference is open to anyone interested in sports. Every sport was covered. Of course there were panels for baseball, basketball, and football, but there were panels for soccer, golf, tennis, advertising, and even hockey. Bill James is a god among nerds. He was a special guest on panels, podcasts, and ESPN interviews. I think everyone is trying to make up for the Baseball Abstracts days. There was a panel dedicated to sports gambling, because it turns out that degenerates who gamble on sports have paved and are paving new roads in predictive sports analytics. TicketMaster started talking about their new PriceMaster stab at dynamic ticket pricing. Probably means more expensive tickets, but maybe there’ll be a last-minute cheap-o (like myself) option. EPSN was all over this thing: They has sponsorship ads in place. They had people on half the panels. They had their own panels. They were even broadcasting live. To end this, I’ll leave you with a video of Kevin McHale, who, though not as hating as Joe Morgan, has never been a fan of all the advanced statistical analysis until (as you’ll see at about 2/3s into the video the video) he realizes that his GM (Daryl Morey) is a big fan of this stuff. So much so that he’s a co-chair at Sloan. Serpico’s excellent post yesterday got me thinking. A professional baseball franchise has two goals which sometimes conflict: winning as many games as possible and drawing in fans. You might think those two go hand in hand but, as Serp pointed out, swapping out new talent every season makes it hard for the fans to invest in the team. Then I started to wonder – how much money? And what’s the tradeoff? And I made a graph in Excel. In the lower half, you get two sudden spikes at the San Diego Padres and the Milwaukee Brewers. They get White Sox level attendance despite playing like, well, the Padres and the Brewers. Where’s the draw? What did the Brewers do last season that I and the rest of the world missed? The Boston Red Sox had 101.4% attendance on average in 2006. That’s not seats sold; that’s actual home game attendance. Look it up yourself. It pleases me to know that John Henry will admit more fans than the stadium has seats; anything for revenue. The trendline continues upward pretty clearly except for one embarassing drop by the Baltimore Orioles. They spent $93.55 million in 2006 on player salaries but only filled 57.1% of their seats on average. They’re spending St. Louis Cardinals money to get Toronto Blue Jays attendance. I don’t know whether this data supports my thesis or Serpico’s. It may be too soon to draw that kind of conclusion. But I do know that it’s really interesting. Today’s post is Part One of Two, the “Pro” argument in a NerdsOnSports exclusive debate over “Moneyball” – or stats-driven baseball management. Serpico takes the opposing side elsewhere. (1) The object of a baseball game is to score more runs than the opposing team. (2) Baseball does not have a clock; it ends when each team suffers 27 outs. (3) Given 1 and 2, the team that can score more runs while suffering fewer outs will win a ballgame. (4) Players earn runs by advancing along the basepaths. This can be done either by hitting or by being advanced through a walk or pitcher error (balk, etc). (5) There is a fixed pool of available players for any given season. There are a fixed number of positions in the starting lineup – nine, to be precise. As Kevin Bacon said in A Few Good Men, these are the facts of the case, and they are not in dispute. Those are the rules of baseball. All of the above are objectively true. (6) Given #4, a statistic which measures all the ways that a player can advance along the bases (for instance, on-base percentage) will be a more useful tool in evaluating a player than a statistic which does not (for instance, batting average). That right there is the core of Moneyball – the idea that many traditional statistics, such as stolen bases, RBIs and batting average are not as useful as OBP, slugging or VORP. Consider: RBI is the number of runs a player bats in. 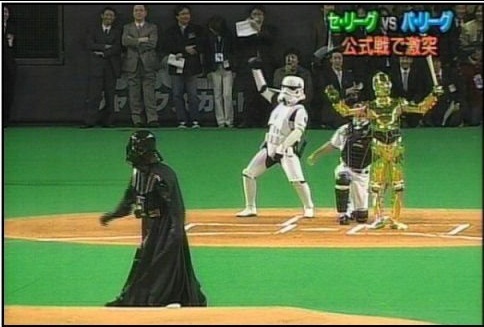 But in order to hit in a run, another player needs to have advanced to scoring position. So your RBI stat hinges on the scoring ability of the player before you in the lineup. This changes every time the lineup is altered, or every time you change teams, but no one thinks to qualify RBI with a little asterisk. Batting average is neat, too, but it doesn’t measure the times that a player will advance a base through being walked. And for the big hitters like David Ortiz, Rickey Henderson or Joe Morgan, bases on balls constitute a significant percentage of their run production. (7) Given #5, teams with less money to spend will not be able to outbid teams with more money. As such, the only way to maintain a competitive edge over those teams is to find undervalued statistics – stats which point the way to potential runs without seeming to. The Oakland A’s do not have as much money to throw around as the New York Yankees (the most lucrative sports franchise in the world after Arsenal Football). Oakland will never beat New York in a bidding war over a hot free agent. What they can do, however, is search for run-generating players who New York overlooks. They do this by mining statistics that no one else looks at (such as OBP, or pitches broken down by ballpark) and turning up players like Scott Hatteberg and Kevin Youkilis. That, right there, is the core of the Moneyball contention. There are certain statistics which illuminate a player’s potential more than others. If those statistics remain overlooked, a money-savvy manager can scoop up big-hitting talent at bargain prices. Such a case seems indisputable. Now that you’ve read my argument, go read Serpico’s counter.